There are loads of conferences coming up. In October, I’ll be attending and covering both the IBM InterConnect event in Singapore (October 9-11), and am currently preparing myself psychologically for the long plane ride. Later in the month, from October 21-25, I’ll be covering the seventh Information on Demand event in Las Vegas, Nevada. I’ll have more info on those soon, but in the meantime wanted to highlight another key event that will probably be flying a little under the radar, the Cúram International User Conference. Entitled “Smarter Social Programs to Deliver Better Outcomes,” the Cúram event will be held starting tomorrow, October 1, through Thursday, October 4, at the Grand Hyatt Washington Hotel in Washington, D.C.
What’s notable about this particular event is its orientation towards helping people who help other people. Social services organizations around the world find themselves in challenging times, with increasing demands for their resources and higher service expectations, at a time when tax revenues aren’t exactly peaking. Many of those organizations have begun to leverage Cúram software to ensure they have the most fitting business and technology foundation to support those increasing demands. At the Cúram event, attendees will learn about best practices from some of the more leading-edge social services practitioners, hear more about the latest social services trends, and network with their peers from around the globe. They’ll also have the opportunity to see the latest Cúram solutions and technology in action, and meet Cúram integrators and partners. You can learn more about the event here, and more about IBM Cúram software here. Click to enlarge. With a population of more than 1.2 billion, India is projected to be the world’s most populous country by 2025. By 2050, it is estimated that India’s urban population will constitute nearly half of that country’s total population, straining an already stressed infrastructure. The good news: Urbanization is an indicator of positive economic development. 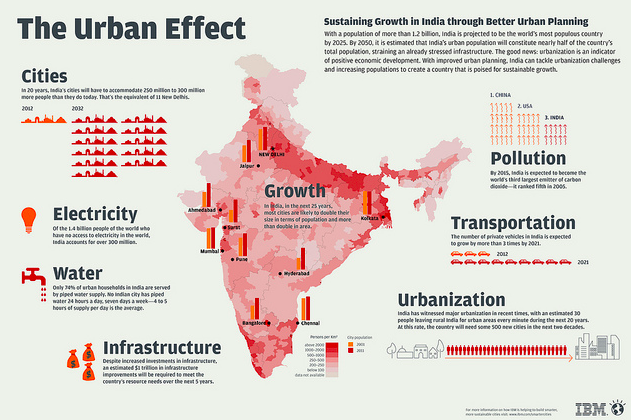 With improved urban planning, India can tackle urbanization challenges and increasing population to create a country that is poised for sustainable growth. We heard a number of discussions about the potential for social listening intelligence last week at the Smarter Commerce Global Summit in Orlando. This is an area I’ve been involved in within the IBM team for several years now, starting with some early explorations for how social data could be informative for our marketing efforts stretching all the way back to 2008. It’s been exciting to watch this space evolve and mature, and with the advent of the IBM Social Sentiment index, we’re starting to see very practical uses of social data for better understanding if not the wisdom, then certainly the perspectives, of the crowd. Yesterday, IBM held a Smarter Cities Forum in New Delhi, India, where we unveiled a new social sentiment capability to assist our customers in their Smarter Cities engagements. We also unveiled findings from the latest IBM Social Sentiment Index on traffic, which looked at public sentiment across India’s largest cities — Bangalore, New Delhi and Mumbai. If you’ve never experienced traffic in India, you can get a taste of the Sunday traffic in this video I shot during my first visit in June 2010. But the recent analysis of publically available social media showed that the worst congestion in India is primarily caused by accidents and bad weather (three out of four times) when looking at the three cities together. It also indicated some interesting variations between the three. For example, social conversation in Mumbai about stress around traffic is about half as high as Bangalore and New Delhi; references to the impact of rush hour on congestion in New Delhi are between five and seven times more negative than in Bangalore and Mumbai. With a wealth of online content and public commentary on social channels such as Twitter and Facebook, city officials need new ways to measure positive, neutral and negative opinions shared by citizens regarding important city issues. The IOC — which combines IBM software and services to integrate city operations through a single dashboard view to help cities improve efficiency — is now augmented with social media analytics capabilities that will help city officials make more informed decisions by looking at unfiltered citizen attitudes and actions, distinguishing between sincerity and sarcasm and even predicting trends as they surface online. The top three factors impacting traffic congestion that citizens in each city talked about most online were diverse. Delhites chattered about public transportation, weather and the stress of commuting, while Bangaloreans show more concern for their overall driving experience, construction and parking issues, and Mumbaikars are talking about private transportation, accidents and pollution more often. Conversation in Bangalore around parking is viewed three times more negatively than in the other cities. Despite recent infrastructure improvements, less pollution and a solid public transit system, Delhites are experiencing a far higher amount of stress (50 percent) than those in Mumbai (29 percent) or Bangalore (34 percent). Most likely, this can be explained by an uptick in rallies and weather events this year, as well as the recent power outage. Surprisingly, sentiment on the topic of construction was relatively positive in Bangalore and New Delhi, and positive and negative sentiment on infrastructure in each was relatively even. Together, these may suggest that the transportation infrastructure improvements being made over the last two years in each city are beginning to positively impact citizens. Analysis shows that the relative negative sentiment for rush hour (35 percent) is one of the key drivers impacting traffic in New Delhi, which may explain why citizens talk about stress significantly more than commuters in Mumbai or Bangalore. By applying analytics capabilities to the area of social media sentiment, organizations are able to better understand public opinions, and city officials can gain additional insights in order to draw logical conclusions about where they should focus their attentions and resources. Take Bangalore, the technology hub of India. Understanding that most commuters prefer private transportation despite negative sentiment around parking and construction may indicate that city officials should consider if it makes sense to advocate for more commuters to use mass transit and invest in infrastructure that will keep up with demand as more companies locate there. Since Dehlite’s indicate that public transportation is the preferred mode of transportation, city officials could use this insight to study which areas have high ridership and less road traffic and then implement similar actions in highly congested areas. In Mumbai, negative sentiment around traffic and weather at the peak of monsoon season (August) generated 5.5 times more chatter than in November. If the city could measure the fluctuation of public sentiment on these potential causes over time combined with specific weather data like rainfall or temperature, it might be able to better prepare to divert traffic during monsoon season or determine areas where a public safety campaign is needed. Public social media content was analyzed by IBM Cognos Consumer Insight, which assessed 168,330 online discussions from September 2011 to September 2012 across social platforms including Twitter, Facebook, Blogs, Forums and News Sources and derived 54,234 High Value Snippets through a series of advanced filtration techniques for insight analysis. The IBM Social Sentiment Index helps companies tap into consumer desires and make more informed decisions by looking at unfiltered consumer attitudes and actions, distinguishing between sincerity and sarcasm, and even predicting trends. The IBM Social Sentiment Index uses advanced analytics and natural language processing technologies to analyze large volumes of social media data in order to assess public opinions. The Index can identify and measure positive, negative and neutral sentiments shared in public forums such as Twitter, blogs, message boards and other social media, and provide quick insights into consumer conversations about issues, products and services. Representing a new form of market research, social sentiment analyses offer organizations new insights that can help them better understand and respond to consumer trends. For more information about IBM Business Analytics go here. You can also follow the conversation at #IBMIndex on Twitter. For more information about IBM Smarter Cities go here, and follow the conversation at #smartercities on Twitter. 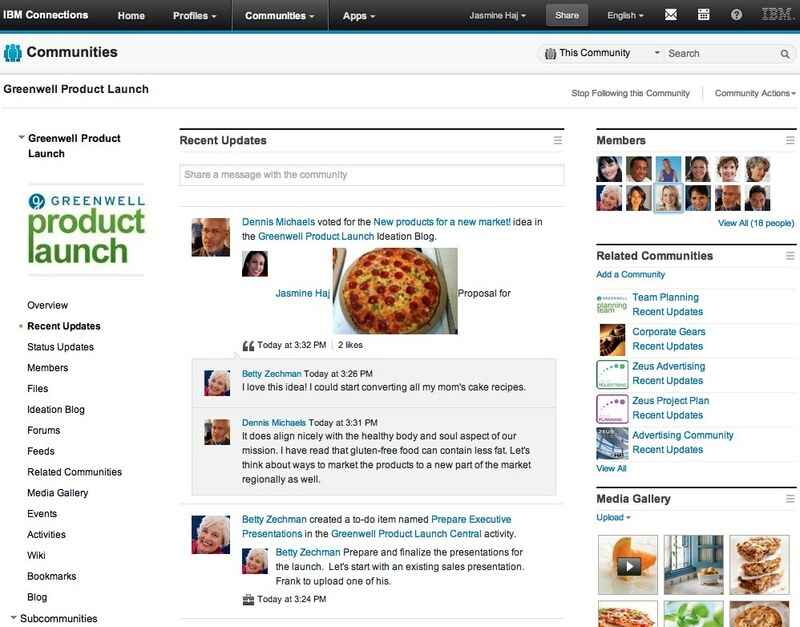 The embedded experience of the news feed in IBM Connections, also known as an activity stream, allows employees from any department inside an organization to explore structured and unstructured data such as Twitter feeds, Facebook posts, weather data, videos, log files, SAP applications, electronically sign documents, and quickly act on the data as part of their everyday work experience. 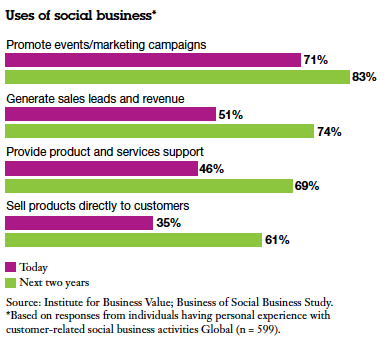 Big news today from IBM re: social analytics, and for some key customer wins on the social business front. First, to the news about social analytics. Today, IBM unveiled new software and services that bring the power of big data analytics into the hands of a social savvy workforce anytime, anywhere. With this new capability, organizations will be able to apply analytics to their social business efforts, allowing them to gain actionable insight on information generated in social networks and put it to work in real-time. Today, more than 60 percent of the Fortune 100 have licensed IBM social software to activate their workforce to improve productivity, and gain insight on data to anticipate individual customers needs. IBM’s leadership role in analytics has been established through a thoughtful strategy that required the expansion of R&D, acquisition and business initiatives across its hardware software and services portfolio. As part of today’s news, IBM announced the availability of its industry-leading social software platform, IBM Connections. IBM Connections incorporates sophisticated analytics capabilities, real-time data monitoring, and faster collaborative networks both inside and outside the organization, whether on premise, in the IBM SmartCloud or using a broad range of mobile devices. IBM also announced today that leading companies around the globe, including Bayer MaterialScience, Colgate-Palmolive Company, LeasePlan, Primerica and Teach for America, are using its social software to achieve real returns on their social business investments. The rise of social media is prompting business leaders, from the CMO to the chief HR officer to the CIO, to evaluate how to create opportunities that drive business transformation through the use of social technology, creating real business value. At the same time, business leaders lack the tools to gain insight into the enormous stream of information and use it in a meaningful way. According to IBM’s CEO Study, today only 16 percent of CEOs are using social business platforms to connect with customers, but that number is poised to spike to 57 percent within the next three to five years. A recent IBM study of more than 1,700 chief marketing officers reveals 82 percent plan to increase their use of social media over the next three to five years. 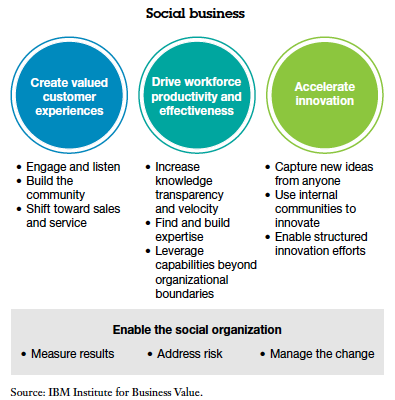 Today, more than 60 percent of the Fortune 100 have licensed IBM social software. There is strong demand for IBM’s social business platform in regulated industries, with 41 percent of Connections 4 beta participants in banking, finance and healthcare institutions. Primerica, a leading distributor of financial products in North America, will utilize Connections and WebSphere Portal, to transform how its agents engage with its 2.3 million policy holders on the fly, to provide increased value for its customers. The company plans to use social business software to improve the overall client experience, drive competitive edge and stay on the forefront of innovation in the financial services industry. You can read more details on Primerica’s adoption of IBM social software here. And in the video at the bottom of this post, you can check out my interview with Digital Influence Group’s Glenn Engler about the challenges and opportunities for social media in heavily regulated industries. To support the burgeoning demand for social business solutions in growth markets, in the fourth quarter of 2012 IBM will open two social business customer support centers to serve IBM’s Asia-Pacific and Latin American clients. Located in Manilla, the Philippines, and Sao Paolo, Brazil, these centers will support the rapid adoption of social business tools in these growth markets. The Philippines and Brazil centers join a roster of IBM social business centers in North America, Dublin, Japan, China and India. IBM’s growing business partner network of more than 39,000 business partners are also bringing new, cutting-edge capabilities to IBM’s social platform every day in areas including gamification, video, compliance, project management and mobility. For example, Actiance provides leading compliance capabilities to thousands of organizations globally, SugarCRM helps sellers use social networking and analytics for effective selling, and Bunchball provides gamification capabilities to IBM Connections. IBM Connections, a cornerstone of IBM’s social platform, is available on premise, in the cloud, and on a broad range of mobile devices. IBM Connections integrates activity streams, calendaring, wikis, blogs, a new email capability, and more, and flags relevant data for action. It allows for instant collaboration with one simple click and the ability to build social, secure communities both inside and outside the organization to increase customer loyalty and speed business results. The new Connections mail capability provides simplified access to email within the context of the social networking environment. The new capabilities empower employees from every line of business, such as marketing, human resources and development to gain actionable insight into the information being generated in their social networks. For example, the Connections landing page features a single location that allows users to view and interact with content from any third party solution through a social interface, right alongside their company’s content, including email and calendar. The embedded experience of the news feed, also known as an activity stream, allows employees from any department inside an organization to explore structured and unstructured data such as Twitter feeds, Facebook posts, weather data, videos, log files, SAP applications, electronically sign documents, and quickly act on the data as part of their everyday work experience. 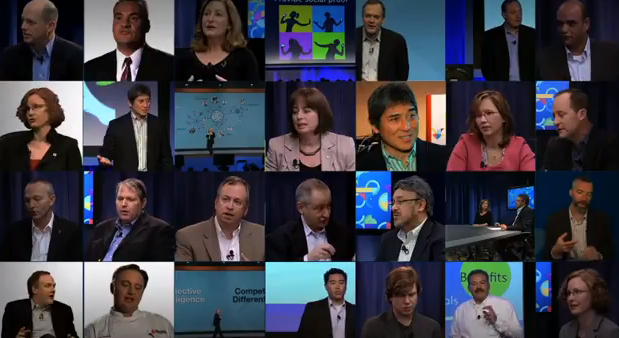 To learn more about IBM’s social business initiative, participate in a simulcast on September 13, 2012 at 1 PM ET at bit.ly/Pn9sqd or sign-up to attend IBM’s Connect conference in January 2013. IBM blogger and tech evangelist Todd “Turbo” Watson interviews Digital Influence Group CEO Glenn Engler at SXSW Interactive 2012 about the opportunities and challenges of social media for heavily regulated industries.